— William Congreve, “The Mourning Bride” (1697). The second installment of Quentin Tarantino’s KILL BILL masterpiece blasts in with “Chapter Six”– Yes, a movie starting at Chapter Six is audacious enough, but this chapter itself is a flashback to the events that engined the revenge of VOLUME 1 – the previous film. Audacity, genius, or insanity? DAUGHTER TO THE SLAUGHTER! Assassin Beatrix Kiddo aka The Bride (Uma Thurman) attends her wedding rehearsal with her redneck fiancé (who looks like Bobcat Goldthwait) at Two Pines Chapel, when Bill (David Carradine) unexpectedly appears. We learn, though cryptic dialogue, that Bill is the leader of the Deadly Viper Assassination Squad, of which The Bride was a member, that he is The Bride’s ex-lover, and that the baby she is gravid with is his. To Bobcat, she introduces Bill as her father (and we see a “surprised” look cross Carradine’s face that is simultaneously hilarious and a testament to his acting prowess). Then the rest of the Deadly Viper Assassination Squad (Michael Madsen, Vivica A. 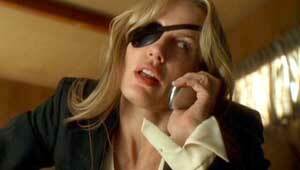 Fox, Lucy Liu, Daryl Hannah) enters the chapel and guns down everyone. With this wedding, The Bride aka Black Mamba wanted out of the Squad, but, like all assassins, her boss would not let her leave with her life. And I have a problem with her method. COCKY CHOP SOCKY! Flashback to The Bride’s training by an overcheesed Chinese sensei ripped from the reels of old kung fu cinema. 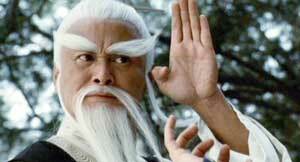 Master Pai Mei is Chia Hui Liu (he played Johnny Mo in VOLUME 1!) so it’s quite laughably obvious he is a young guy with old guy makeup. But with Liu’s eccentric, sarcastic performance, the audacity works! Tarantino leaches and grains the filmstock to make it look like those trashy 1970’s kung fu films; wirework, superhuman disciplines and Pai Mei’s cruel swishing of his footlong beard. KILLING BILL. The Bride has come a long way for just this vengeful, bloody moment and finds – her daughter B.B. (Perla Haney-Jardine), thought dead, happily playing with Bill. And before we can forget that Tarantino is the master of making mundane dialogue sound compelling and nerve-wracking, Bill launches into monologue after monologue. He speaks of B.B.’s goldfish, he speaks of Superman being the real identity and Clark Kent being the disguise, he speaks of his love for The Bride, yet everything he says in that measured rasp is like winding a spring tighter until it threatens to explode in your face. (We even get a quick, darkly funny flashback to The Bride discovering her pregnancy – just as an assassin has tracked her down. The dialogue in this scene is bravura not only for Tarantino’s writing but for the actors pulling it off so convincingly.) We wonder whether Bill isn’t speaking so much because he knows a reckoning is imminent and that one of them is going to die tonight, so wishes to prolong his time with the woman he obviously loves, but whom he must kill out of principle or be killed out of principle. After the massive fight sequence with the Crazy 88s in VOLUME 1, we wondered how Tarantino and Woo-Ping could top each successive fight scene. They did. It was not a case of escalating the violence, but moving it in different directions. Unlike the STAR WARS saga, where Lucas and his choreographers kept repeating themselves (see one lightsaber battle, seen ’em all – even poor Yoda got boring with his dynamic ghetto moves), Tarantino and Woo-Ping never rehash the same old moves. 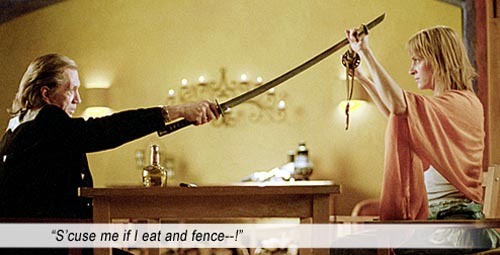 As Elle’s fight was an ingenious closed quarters brawl, The Bride and Bill’s last pitched battle is fought with katanas and hands and the Five Point Palm Exploding Heart Technique (ain’t the language just beautiful?!) – while sitting in chairs! Starring: Uma Thurman, David Carradine, Michael Madsen, Daryl Hannah, Vivica A. Fox, Lucy Liu, Chia Hui Liu, Michael Parks, Bo Svenson, Jeannie Epper, Stephanie L. Moore, Shana Stein, Caitlin Keats, Christopher Allen Nelson, Samuel L. Jackson.